New Project, ‘Next stop – Liriodendron’ Images selected for my inclusion in August group Exhibition. “Boots” the ‘Doodle’, finished painting tomorrow. Title-“Taking Flight” First sequenced post. 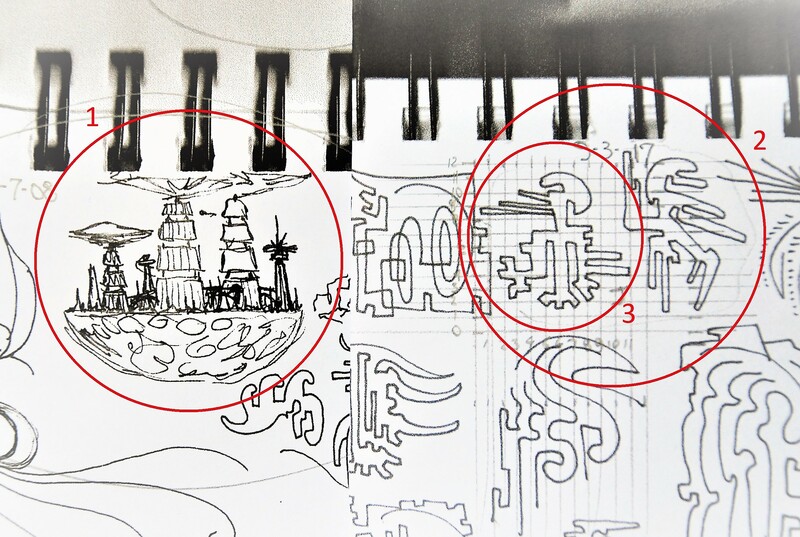 Posted is ‘The Doodle’, from Sketch Book Four, 2009. This selection is from the +12 portion of the project-Doodles selected by friends. This one was selected by Lee. 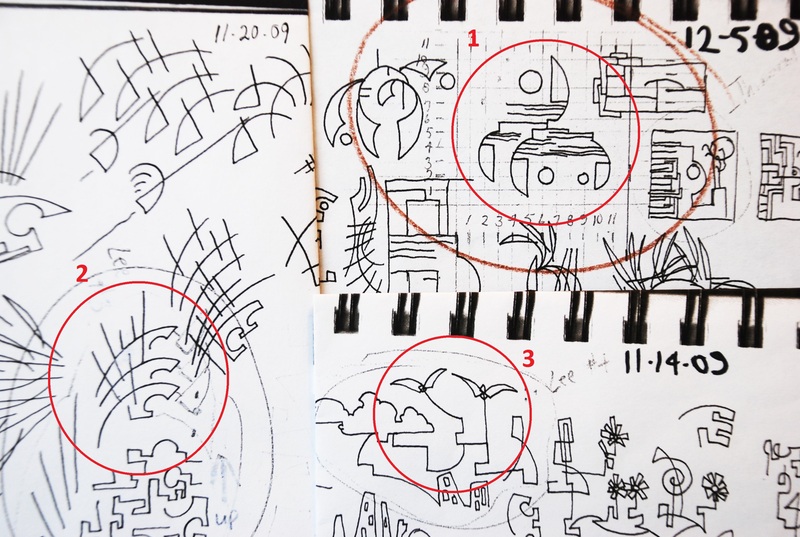 As individuals were chosen to look through the Sketch Books for this project, I asked that they select one to four ‘Doodles’ and in turn I would chose which one or ones I would use. Lee selected four and the one circled with a number One was the one I chose to work with. 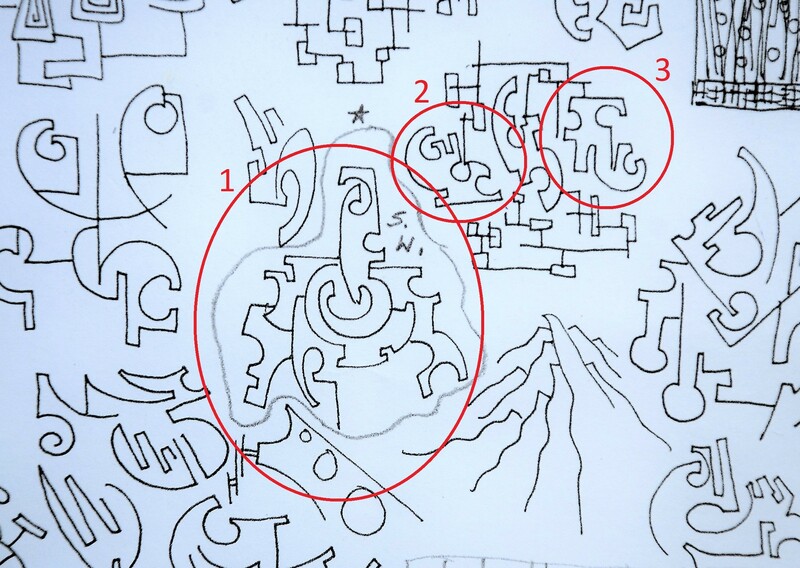 The more I glanced at Lee’s other chosen ‘Doodles’, it seemed like two others, number Two and number Three, had similar elements/shapes that whispered in soft tones “Please consider me, please consider me”. So I did. Next Monday’s ‘Worksheet’ post shows the resolution. Title-“Stick Man” Second sequenced post. 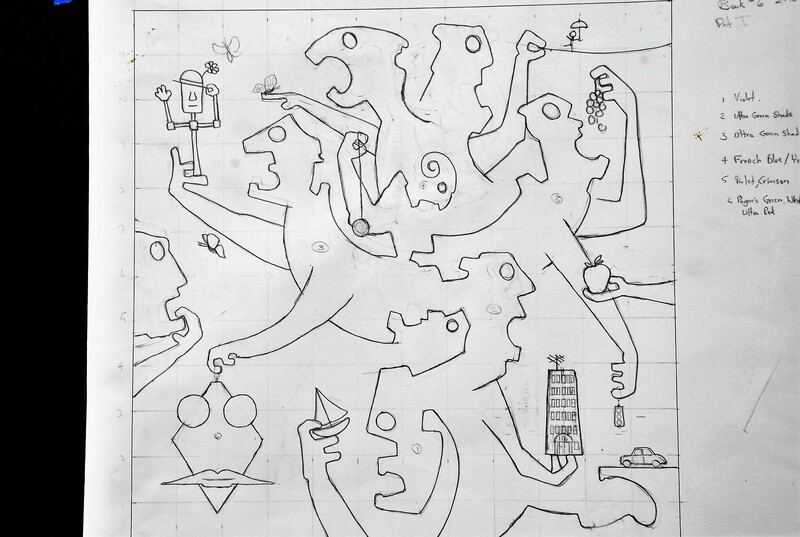 Posted is the 12” x 12” pencil Worksheet to be used for the ‘Stick Man” painting. 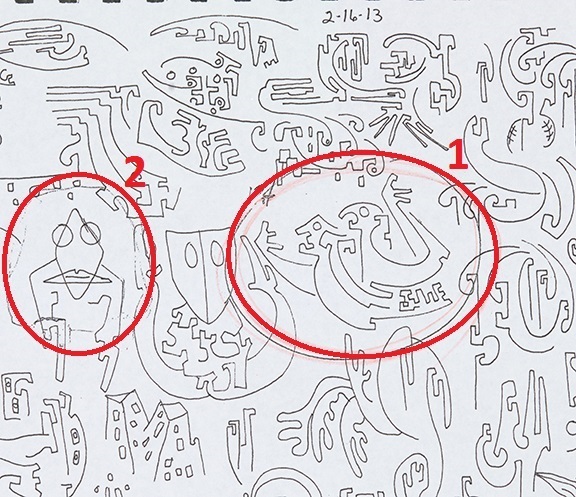 I decided to expand on the two figures in the chosen ‘doodle’ and with it came the thought process of the narrative. Unlike “The Candy Store” and others, which have a strong central narrative, there is a menagerie of small semi-related narratives sprinkled around to the various characters. 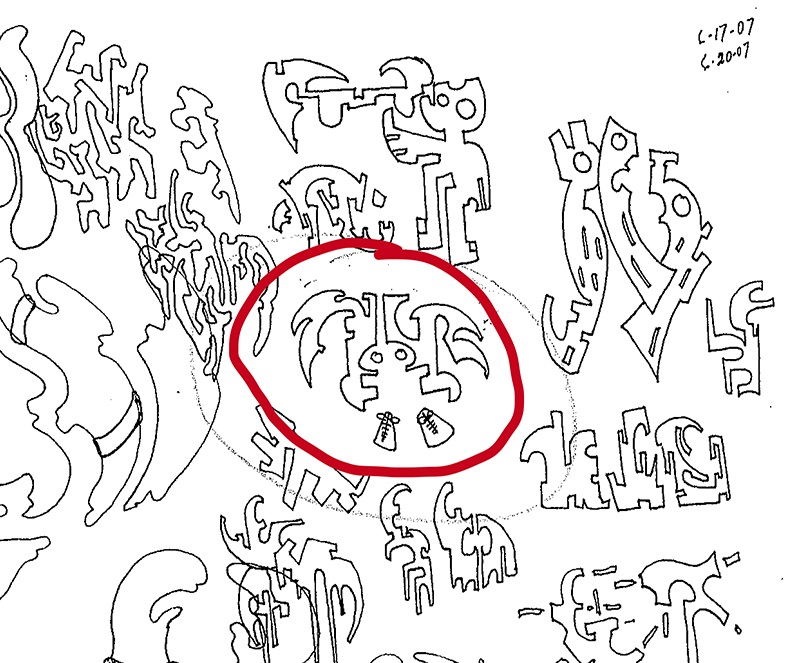 The second ’doodle’ I incorporated as a mask, hanging from the hand of one of the figures in the lower left area. Lastly, the hand-held ’toy’ in the upper left corner is the “Stick Man”. Contemplating this figures hand, begging to hold something, a ’doodle’ which I can’t seem to locate in any of my sketchbooks came into my head. I don’t know if it’s a real, I-can’t-find-it ‘doodle’ from the sketchbooks, or imagined, but he insisted on being included, enough that I named the painting after him. 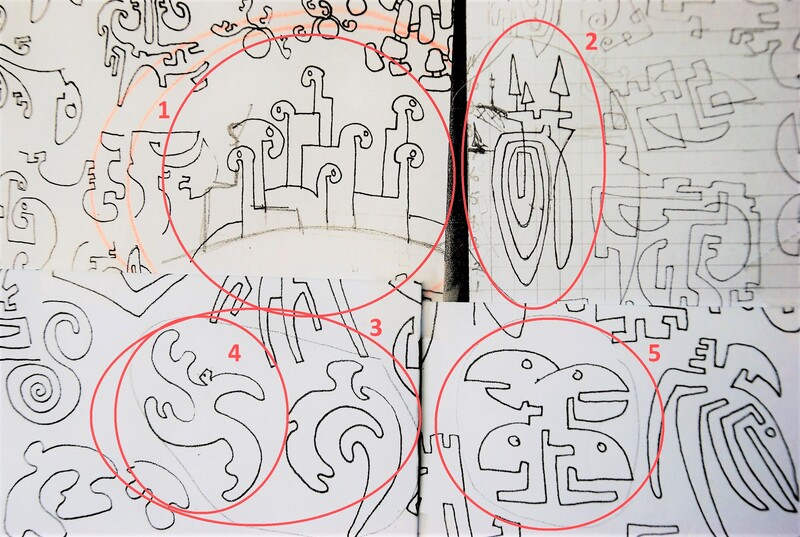 There still a few questions about a few of the objects in the design but they, I hope, will be resolved during the painting process.